Welcome Mexican gray wolf brother M958, Gray! He was born in 2005 at the Columbus Zoo, into a large litter of 10 puppies. He and his brothers spent their first years at the Heritage Park Zoo in Prescott, Arizona, before moving to the Phoenix Zoo, their long-time home. Gray recently retired to Southwest Wildlife and seems to be quite relaxed at the sanctuary. There are so many new things for him to see, smell and hear - especially the other Mexican wolves living in adjacent enclosures. 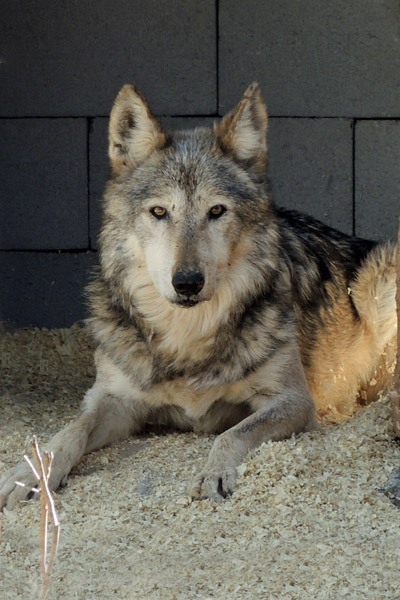 Gray is sharing his enclosure with a single female wolf, Toluca (F986) and they're adjusting to life together. He's quite charming and we hope he'll be happy here!